An idea is always the beginning of something bigger, for that reason should be converted into value, than transformed into a positive economic result. Throughout our daily lives, ideas arise at a specific moment. It happens when we try to improve what now seems complicated or, for example, we see an opportunity. Everyone is part of the innovation cycle, although we do not realize it. Contemplating this cycle is different thant actively innovating , very different; It is not easy, it requires talent and motivation. Where is the entrepreneurial talent? Fortunately, there is an entrepreneurial ecosystem, inside and outside the universities. People who dare to innovate, talented professionals, who strive and who bring to market disruptive products and services that can transform certain parts of our daily life and that deserve an opportunity. To realize all the potential that exists in universities, vocational schools, science parks, business incubators and co-working centers, we just have to look for and trust in these infrastructures. But not everything is positive. Thinking about the technological nature of smartable, we consider very important the cooperation and the help that we can give to those people o companies are starting our same adventure. Due to marketing difficulties we want to avoid that their ideas and dreams could end up stored in a drawer. After all the hours devoted to that project and all the dreams put into it, is frustrating see everything falls down and fails. smartable try to avoid it becoming a marketplace. A Marketplace is just a platform or website that allows you to contact sellers and buyers to make it easier business transactions. The most famous examples of Marketplace are second hand or sales applications to sell second hand products or ebay. You look for what you need then you get directly in touch with the seller (or reverse). Products could be physical, but always we mean intangible products such as source codes, services, electronic books etc ... As you can see, it is a very complete sales channel. Now we are going to show you some examples of Market place that have seemed curious to us and could help you to understand better the concept. 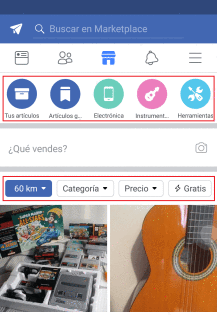 Since January of last year, Facebook allowed to create buying and selling groups focused on second-hand physical products. Does it sound like you have seen it? This social network sells it as an extra service for being inside, so you do not have to download anything new or register anywhere, just use the user profile you already have. Let's see an example, we go to the little tab of the store and we will all options, on the one hand, if we want to be sellers and upload our article and another we can see the other items they sell to buy. As you can see, this service can be very interesting if you want to sell products that you no longer want, taking advantage of the large number of registered users on Facebook. This is another example of Market place but in the fashion sector. Asos Marketplace is a portal where you can buy clothes from many brands, not only from ASOS. A place that allows you to buy clothes from emerging designers, as well as vintage clothing and second-hand clothes. Also, just like the Facebook Marketplace you can sell the clothes you no longer use or create clothes and sell them on your own. As you see, the marketplace can be a place where you idea can be developed and be a success, smartable wants you make it! Why have smartable to carry out your business idea? After almost 2 years of experience, we have opened a path and positioned ourselves in the market. Online reputation have grown allows us to create a small distribution channel, multi-disciplinary collaborators and influencers in continuous evolution. We were selected by CEEI Elche in September 2017 as one of the 5 participating projects in its CEEI Impulsa pre-acceleration program, obtaining the validation level of lean-startup. Winners in November 2017 of the Sixth Entrepreneurial Projects and Entrepreneurship Competition of L'Alcoià i el Comtat as the Best Company for our adaptability skill, entrepreneurial character, viability. Now we are part of the Valencian Tourism ecosystem thanks to a project attached to INVAT.TUR Emprende. smartable is a company registered by the Valencian Tourism Agency in the registration of tourist companies, establishments and professions in the Valencian Community as a tourism company of complementary services (registration number NR-A-160) . In 2018 we have been at Santiago de Chile where we have participated in the 1st Tourism Technology Fair of Chile (Tecnoturismo) with the Tourism Technology Center of the Andrés Bello University, through ITH (Hotel Technological Institute). We keep working on our own roadmap with the aim of being present, among other events at FITUR 2019 with our disruptive services smartWE, WEBAT and smarTEA. WHAT DO SMARTABLE NEED TO EVOLVE INTO A MARKETPLACE? Once have been identified the talent and the problem that have to be solved, we mean the initial supply and innovation demand, the transformation of our web page will start to turn it into the commercial link and evolve to LIMKeD. That’s why we are looking for disruptive products and services, analyzing the situation in which they are; idea, minimum viable, etc. along with your business model to see its economic viability. Still have doubts to collaborate with us? Send us more info about your idea and we'll tell you why it can be interesting and start a collaboration.